I have flowers growing on my design wall. 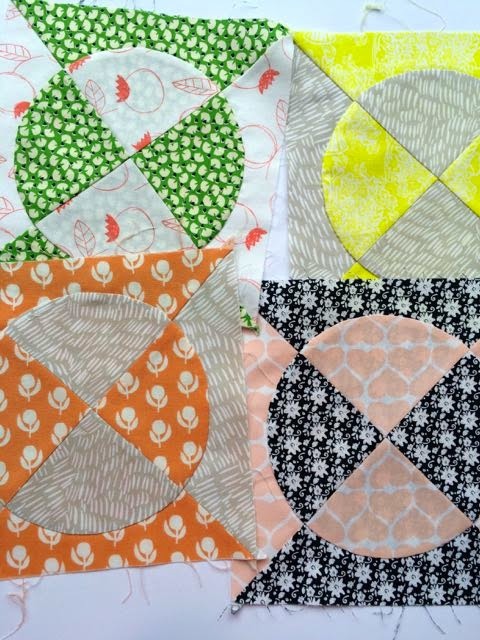 These are the blocks I've been making with the Umbrella Prints fabrics I featured in a recent post. Some other friendly fabrics snuck in too - dots, stripes, crosshatch. It just goes to show they can all play nicely together. Umbrella Prints latest range is called Flowers so a floral theme was the obvious choice. Perfect for me because I do love flowers. I've been making up blocks as I go along, just whatever suits the patterns in the fabric and what style suits me when I have time to sew. I have to admit my approach to applique is a bit liberated. I don't draw a design on the fabric or do much preparation. I simply cut out shapes of freezer paper and iron them onto the applique fabric and use that as a guide to sew. They turn out a bit wonky but I like that look, no flowers are perfect in real life after all. 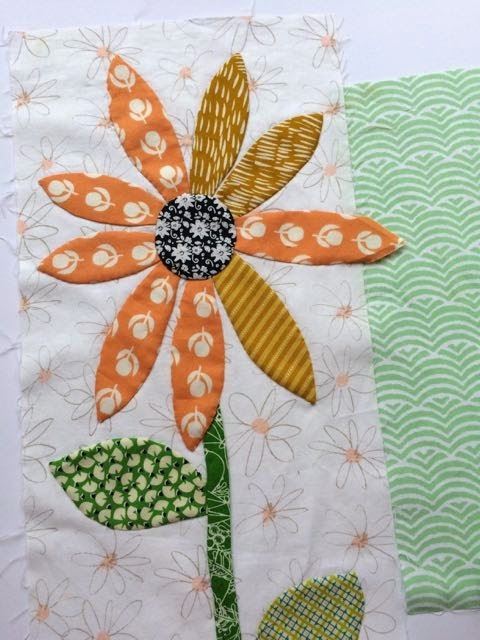 My plan is to keep making a mix of blocks until my stack of Flowers fabric has sprouted into a garden of fabric flowers. Then I'll sew them together and call it a quilt. An afterthought - In the comments Dawn asked about my applique method. Here's a link to how I sew my applique. 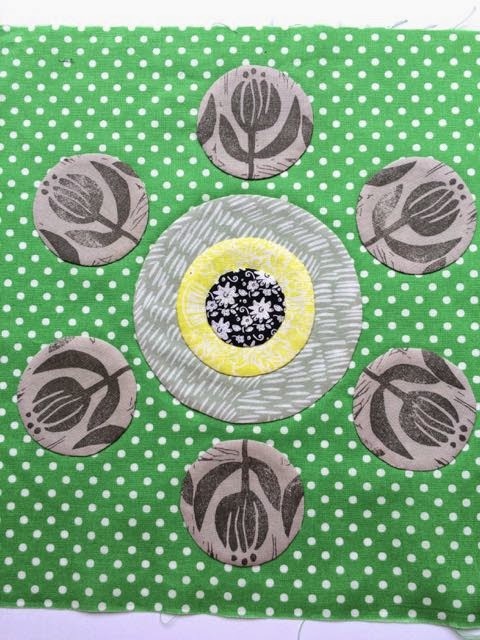 The tutorial is for circles but I've sewed all sorts of shapes this way, even birds. One day I'll try some other applique methods, I'm curious about back basting, and it would be wonderful to needleturn like a pro, but in the meantime this works for me. These blocks have a gorgeous retro feel. Admire your technique! I am so in love with these flowers! They have your stamp all over them. :) Such a fun way to do applique too. I quite enjoy that method myself! You sound just like me - I am always thinking "I'll just do this with it, and call the whole lot a finished quilt"1 I do love your flowers - there is no other way to work - is thee? Like all the flowers and I am waiting to see another special quilt. ohhh... I love your new project dear Rachael! Soon your garden will be quite big! So far it is so lovely and I can't wait to see more! i always get so excited when i see you've shared a new post! great fun with these blocks! i loved the 'liberated' description! i like it wonky myself. that's me. for so many years i was so hard on myself about perfect seams/stitches with seam ripper at the ready and then i just stopped that. i enjoy the process of sewing the wonkier the better. Gorgeous start to your new garden! But..... freezer paper, fabric and an iron doesn't make appliqué work like yours! Care to share the details? Those umbrella prints look great in your block. Love the fussy cutting. Are those steam punk blocks.? how is the sewing room coming together? wowza wowza wowza. I am so in love with that tulip! Those blocks are looking too cute for words ! Flowers perfectly depict you! 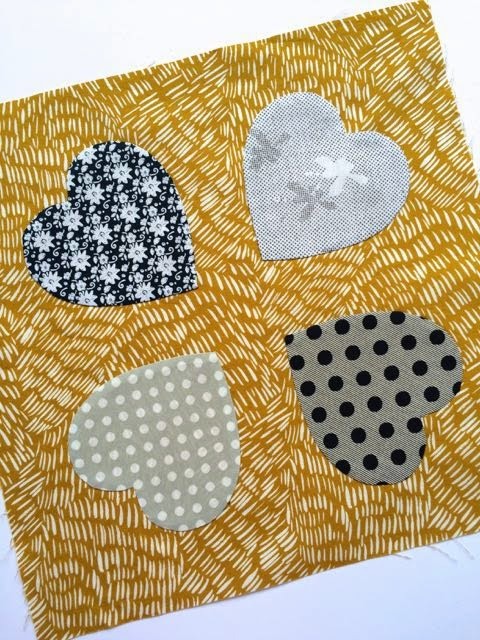 I'm also working on a quilt that is a miss mash of blocks and applique. Your lovely bright, crisp and beautiful bouquet of flowers are wonderful. Wonderful color and layout. Great plan, it will be like a real flower garden! Wonderful! And so uniquely you. As spring begins to sprout here, your quilt is the perfect inspiration. I smiled when I saw the first flower of a daisy, just for you and then when I saw the last photo and saw how tall it had grown....that was just too cute. How delightful! Love the fussy cut prints and the colors are fabulous! Everything's covered in snow where, so it's nice to see some flowers!! Such fun. Really makes me want to get back to my bright sampler quilt! https://www.youtube.com/watch?v=gM-Vn_IZHx8 This popped into my head when I saw your flowers, esp the 3rd one. This is such a fun way ton use those fabrics! Thanks for sharing how you do appliqué. Gorgeous. I love appliqué and combining it with pieced blocks. You have a beautiful selection of fabrics there, and I love how this is progressing. I thought I recognized those fabrics... They were in my trimmings pack. Your flowers are wonderful and so different from what I did with my fabrics. How amazing the different paths the same fabrics can take you on. I use a similar method, but I paint the seam allowance with liquid starch with a paintbrush before ironing. Then I pop out the freezer paper. I find the starch keeps the ironed seam allowance in place than just ironing it. Can't wait to see how your flower garden grows. 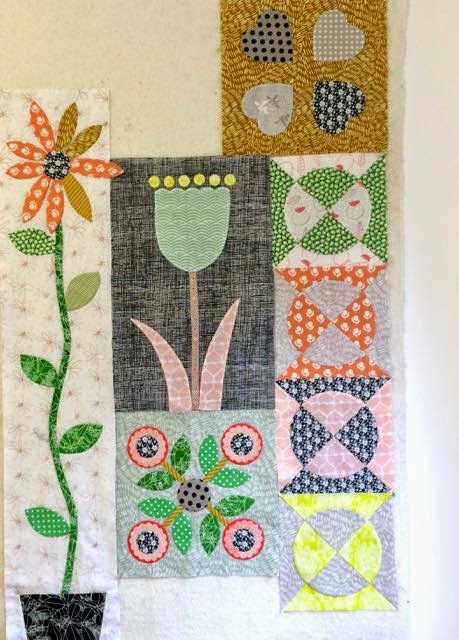 A flower garden sampler, love the effect and the idea. Great blocks so far, I'm imagining this one is a lot of fun to do. Of course you do..The minute I saw the name of the post...I knew it was you!! I love it. I love to work that way...I am so so sorry I made that ugly Cotton and Steel..Oh, well...it served its purpose for my status in life..no think.. Someday I may see Umbrella fabrics in real life, until then, I will enjoy seeing what you do with them. I am crazy for tulips & tiny pots growing giant flowers. Keep sewing! I love your flowers. Reminds me of that season of spring . Nobody does flowers as well as you do - love this so so much! I can feel spring coming! Fabulous blocks - love 'em!! Your blocks look perfectly lovely to me! It's funny, I was thinking of starting some random blocks too! I recently purchased the old Suzuko Koseki book "Playful Patchwork" and it has lots of these type of blocks in it! And there is a new Jen Kingwell book out that I have on order! Maybe they will play nicely together? I love the colour palette you've chosen! The spotty green with the bold orange is gorgeous! Flowers are definitely in your soul. Whether you are arranging real flowers or creating and arranging fabric flower blocks, they are all winners. Look forward to seeing them in a quilt. Those flowers are beautiful! I'm a die-hard freezer-paper-appliquer too (except for circles, I can't get them to press without points so I use a heavier template and stitch around the seam and then draw it up haha). And do you leave your freezer paper sticky side up? That way the seams will stick down when you press them under! 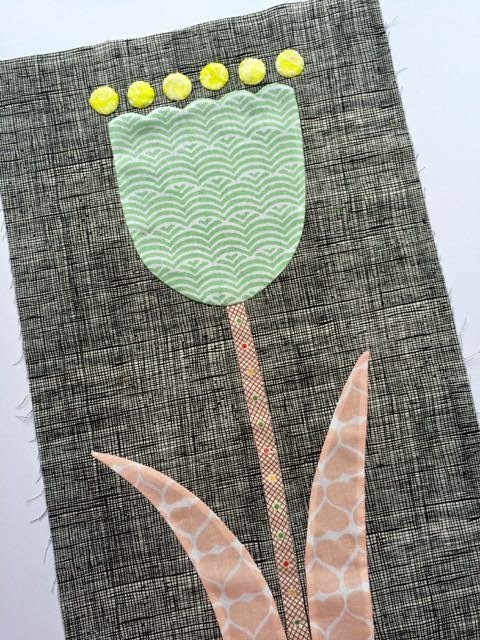 Now Sweet Rachael who else would have Flowers on their Design Wall...just perfect for you! What a great collection of blocks you are putting together. I wonder how it will turn out? It sounds like it will talk to you as you go along. Your garden is growing beautifully. Love some of the fussy cutting you have done! Such gorgeousness, this quilt will be a real beauty. Gorgeous - love love love - the colours are beautiful. Feeling very inspired. Thank you! What a darling project you are progressing on, Rachel. I invite you to link up to WIPs Be Gone to share all these flowers for us who are knee deep in Winter grays and white. your flowers are so perfect despite your haphazard method :-) I really must try applique again one day! 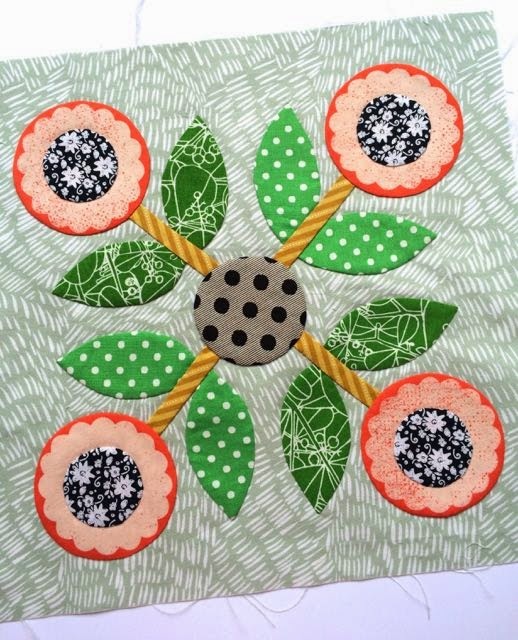 I love, love, love your applique flower blocks. I am very intrigued as to what you will make with them. You have used those fabrics to perfection (in my opinion). These are all beautiful Rachael. I love the orange petal that is moving in to the block next to it!